Donald Trump to meet with Kim Jong Un in Vietnam. February. 07, 2019 07:27. hic@donga.com,lightlee@donga.com. The second summit between U.S. President Donald Trump and North Korean leader Kim Jong Un is scheduled to take place on February 27 and 28 in Vietnam. It has been 260 days since their first summit in Singapore on June 12 last year. The U.S. and North Korea have notified of a concentrated negotiation to achieve substantial denuclearization results by notifying the two days summit in advance. Working-level officials of the both countries met in Pyongyang on Wednesday and started coordinating on the outline of denuclearization that will be included in the "Vietnam Statement." 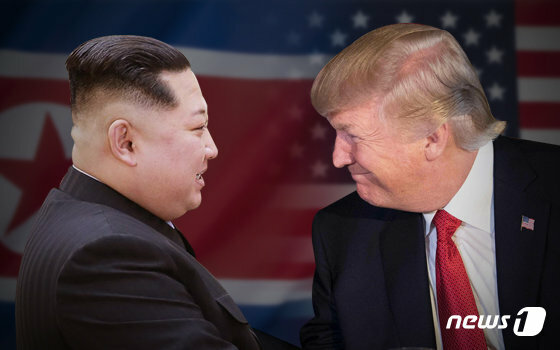 President Trump made the announcement during his State of the Union address on Tuesday (local time) that he “looks forward to meeting with Chairman Kim in Vietnam on February 27 and 28” and that “the historic push for peace on the Korean Peninsula was part of Washington’s bold new diplomacy.” Unlike the first summit, of which the schedule was announced through Twitter, President Trump has revealed details of the second meeting with Kim at his 2019 State of the Union address. The specific city in Vietnam where the summit will be held has not been announced but it is said that Da Nang is most likely. “It appears that there is some protocol related last minute negotiation between the U.S. and North Korea,” said a diplomatic source. According to the U.S. Department of State, President Trump will leave Washington on February 25 and arrive in Vietnam on February 26, and depart on February 28. North Korean leader Kim Jong Un is expected to arrive in Vietnam on February 26 at the latest. Washington and Pyongyang are expected to focus on detailed negotiations to narrow their differences over the denuclearization measures North Korea will take and the corresponding measures the United States will propose. While the hermit nation argued for "simultaneous and gradual" measures urging Washington to take corresponding measures based on North Korea’s denuclearization steps, the United States has emphasized "simultaneous and parallel" measures that highlights Pyongyang’s proactive denuclearization actions in order to see Washington's corresponding measures. Previously, U.S. special representative for North Korea Stephen Biegun revealed during a lecture he made at Stanford University last week that the United States may embark on corresponding measures such as the declaration of the end of the war and creation of a peace regime in the event North Korea engages in "nuclear freeze → nuclear report → inspection and validation → abolishment" steps. Mr. Biegun arrived in Pyongyang Wednesday for the meeting with his counterpart, former North Korean ambassador to Spain Kim Hyok Chol, after visiting at Osan Air Base at Pyeongtaek, South Korea. The meeting is likely to continue through Thursday, hinting that there could be last-minute working-level talks as there were during the first summit. South Korean presidential spokesperson Kim Eui-gyeom also said that Vietnam is expected to become the best background for North Korea and the United States to write a new history.